Recently a publication in the Internationa and American Associations for Dental Research (IADR/AADR) regarding the use of a 3D printed scaffold for Periodontal tissue engineering in a human patient, along with a review of 3D printing for Oral and Carniofacial tissue engineering sheds light on the advancements of 3D Printing and its uses in Dentistry. In the case report titled “3D Printed Bioresorbable Scaffold for Periodontal Repair,” researchers Giulio Rasperini, Sophia P. Pilipchuk, Colleen L. Flanagan, Chan Ho Park, Giorgio Pagni, Scott J. Hollister and William V. Giannobile have reported the first ever human case of treatment of a large periodontal osseous defect with a 3D printed, bioresorbable, patient specific, polymer scaffold along with signalling growth factor. In the case mentioned the patient has severe destruction of periodontal tissues and mobility in the affected teeth, the willingness of the patient to preserve the teeth helped in following up this method with the treated site showing good results for 12 months but it had failed in the 13th month. With bad long term prognosis it is a letdown but the positive in this is that for the duration of 12 months the treated site was healthy and healing. What factors caused for the failure are yet to be diagnosed and if the necessary changes are taken up we can see great success in this technique. With this we can surely say that 3D printing can be of great help in reconstruction of dental and even craniofacial anomalies in the near future. 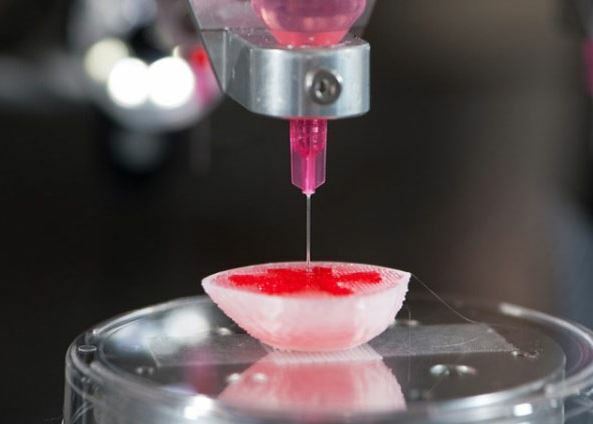 In a review by Fabian Obregon, Cedryck Vaquette, Saso Ivanovski, Dietmar Hutmacher and Luiz Bertassoni titled “3D Bioprinting for Regenerative Dentistry and Craniofacial Tissue Engineering” have mentioned various methods of 3D bioprinting and have also summarized the various biomaterials which can be used and utilized for manufacturing of scaffolds for periodontal treatment as well as in Cranifacial tissue analogs. The materials mentioned are Polymers, Hydrogels, Ceramics, Composits and Cell-aggregates all these should be used in different cases and can be used in 3D printing to give a precise fit to the patient undergoing treatment. Wow. I just heard about 3d skin printing, and now 3d for periodontal repair. It’s amazing what technology can do.